The committee are delighted to announce that Bríd Harper will be honoured at the 2019 Festival. Bríd Harper is the niece of that wonderful Castlefinn fiddle player Frank Kelly and Brid was encouraged by her parents and uncle to play the fiddle as a young girl. 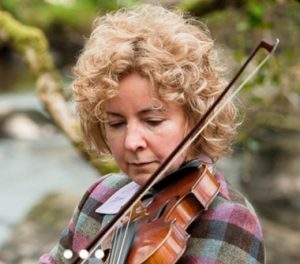 Her family home was a mecca for Irish music and Bríd today is hailed as one of the finest exponents of traditional fiddle playing in the world. A regular player with Dermot Byrne and Steve Cooney on the traditional music circuit, Brid is renowned for her encouragement of up and coming musicians. The good news is that Bríd will lead the Master Class at the 2019 Cup of Tae Festival School of Music. This is a wonderful opportunity for musicians of the fiddle to be in the company of a world class performer. It is also appropriate that Bríd follows in the footsteps and joins her uncle Frank as a recipient of the Guest of Honour at the Cup of Tae Festival. Again, another super festival is promised. This entry was posted in Uncategorised and tagged Bríd Harper, fiddle, traditional irish music on 29th March 2019 by editor.